We offer an integrated program of self-transformation leading to self-realization in the authentic tradition of Swami Rama of the Himalayas. Our parent organization, AHYMSIN, Association of Himalayan Yoga Meditation Societies International, is dedicated to making available the teachings of Swami Rama. For 200-Hour certified students from other Yoga Schools seeking 500-Hour certification through HYT-TTP: The emphasis of HYT-TTP is cultivating meditation and spiritual sadhana in the Prana-vidya Hatha Yoga “style,” therefore, all new HYT-TTP students need to form a solid understanding of basic principles and techniques taught by Swami Rama and Swami Veda Bharati. Entry into HYT-TTP is either at Level One of the 600-Hour program or at the 200-Hour Level. 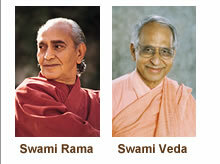 Why become a Yoga Teacher in our Tradition? Our program will deepen your personal development so that you can transmit authentic yoga teachings to others, not only from a storehouse of academic knowledge, but also from a depth of personal experience. We welcome all worldwide seekers from the aspiring to the experienced teacher. Our comprehensive curriculum offered through home study, mentoring, and ashram retreats presents all aspects of yoga and meditation in a spiritually inspiring context. HYT-TTP is now a member of CYA International.